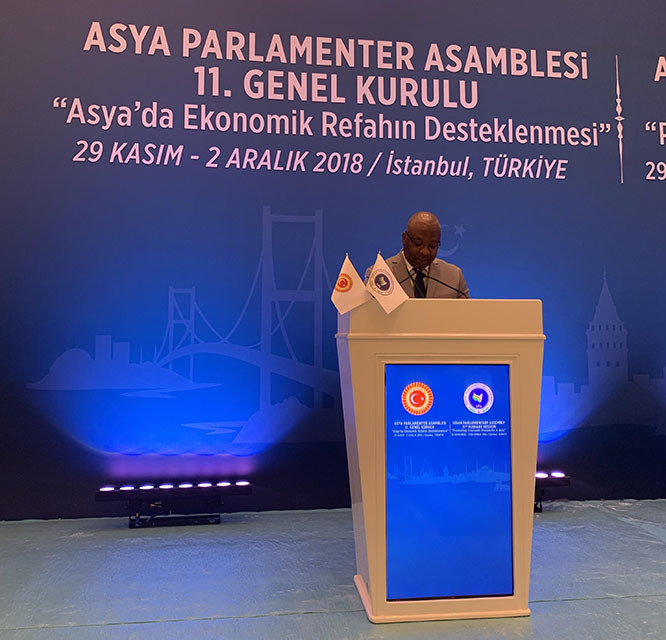 The PUIC Secretary General, addressed the 11th Plenary Session of the Asian Parliamentary Assembly..
His Excellency the PUIC Secretary General, Mr. Mouhamed Khouraichi Niass, addressed the 11th Plenary Session of the Asian Parliamentary Assembly (APA), which was held in Istanbul, Turkey, on 29th November to 2nd December, 2018 under the theme: “Promoting Economic Prosperity in Asia”. The Secretary General underlined that the great potentials of Asia, its geopolitical position and the diverse links among its peoples render this continent well-suited for increasing economic prosperity and a promising future. It is a great honour for me to attend for the first time the proceedings of the 11th Plenary Session of the Asian Parliamentary Assembly (APA) in my capacity as the PUIC Secretary General, which is held in the beautiful city of Istanbul, ancient gateway of Turkey to the world, where ideas interact through fora, meetings and conferences that discuss what is good for humanity. 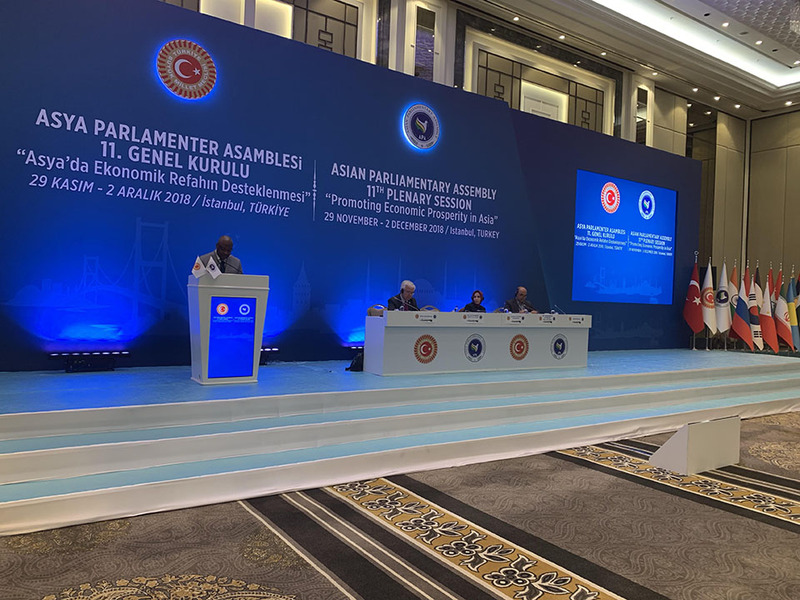 The Parliamentary Union of the OIC Member States (PUIC) maintains bonds of good relations with the Asian Parliamentary Assembly, especially that most APA members are also PUIC Members. Both organizations attend the activities of each other in an Observer capacity. Furthermore, both of them share common action to extend further bridges of friendship and cooperation among parliaments for the benefit of the peoples of their respective states as well as for the entire world. The theme of your current conference, i.e. “Promoting Economic Prosperity in Asia” is of great significance as it relates to a continent which has witnessed an economic resurgence that dazzled the world and made Asia into a region of international polarization. Preservation of this economic boom in Asia has necessitated deployment of prompt and continuous efforts in the shadow of international crises that almost stormed the world around you, and the shadow of turmoil, agitation and disputes that imperil the stability of Planet Earth. The huge potentials of Asia, its distinctive geographical position as well as the diverse links among its peoples render it well-suited for increasing economic prosperity and a promising future. At this juncture let us recall the United Nations General Assembly’s Declaration on “Transforming Our World: the 2030 Agenda for Sustainable Development” issued on 2015” which should be considered as a reference to achieve economic prosperity. Furthermore, according what was mentioned in Bali Declaration of 2017, on sustainable development, Parliamentarians should have continued active involvement which can help to ensure effective implementation and timely realization of the sustainable development goals, through enactment of relevant legislation, adoption of enabling budgets, and promotion of awareness, accountability and social responsibility; following these recommendations we can achieve our goal i.e. promoting Economic prosperity in Asia which can help to eradicate poverty in all its forms and dimension. Certainly your conference will contribute to the crystallization of a new vision of a better economic development and cooperation that promote benefit and growth to your states. In conclusion, I thank you for your kind invitation, and wish success for your Conference.